Published 2008-05-27 in sections English, Digital World. Yesterday I was visiting the Open Source Expo Karlsruhe, a new, quite small conference, at which the guys from OpenStreetMap hat a booth. 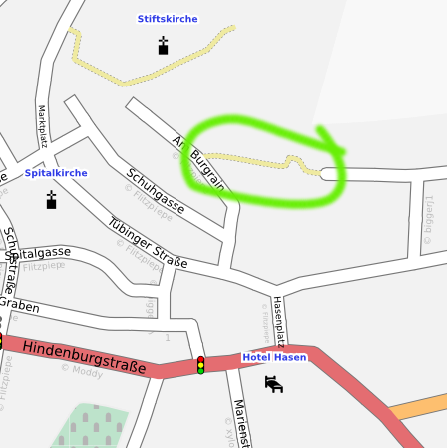 I was amazed by the progress of OpenStreetMap while I wasn’t looking (which is just a few months, I guess); their level of detail in some places like Karlsruhe is astonishing. The live data can also be seen on the OpenStreetMap map, of course. Unfortunately, there is not much to map around where I live in Karlsruhe, even the driveway to my dorm is included, but maybe I can do some proper mapping (with a GPS device) in Herrenberg someday.